I know Marc Chagall quite well. First, as my husband and I were travelling from Germany, where we had bought a car, to Paris, we stopped at Metz, where Chagall had created stained-glass windows to replace the ones destroyed by a fireworks display honoring Emperor William I, in 1877. We also stopped Reims, where the kings of France were crowned and where Chagall would also replace molten stained-glass windows. Yet, I love Chagall (7 July 1887 – 28 March 1985). He was born in Russia, but moved to Paris in 1910, at a time when “isms” in art followed one another at a pace so rapid one could barely keep up. In this regard, Chagall is credited for having influenced the Surrealists. But Chagall was Chagall, true to himself. In fact, he never left childhood. He loved France but returned to Vitebsk, his hometown, to marry Bella Rosenfeld, the fiancée he had left. 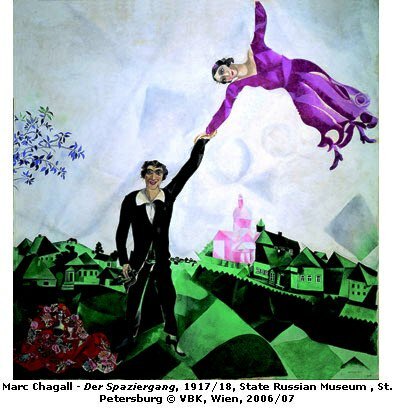 War broke out, so Chagall remained in Russia until the early 1920s, when he and Bella travelled back to Paris. During the 1930s, before World War II, a large number of Jewish artists, scientists, and other luminaries had moved to North America or sent their children to Palestine. But Chagall stayed in France until a quick withdrawal had to be set in motion. He was a famous artist, which protected him. He left France in May 1941. Bella died in New York of what seems a virus infection, which, I should think, could have been cured. By then scientists had developed penicillin. 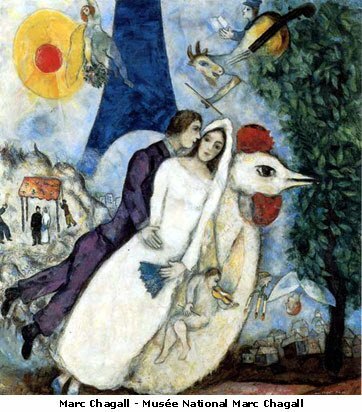 However, Chagall remarried, at least briefly, but Bella was the woman of his life. modernism, outliving Joan Miró by two years—he had experienced at first hand the high hopes and rushing disappointments of the Russian Revolution, and had witnessed the end of the Pale, the near annihilation of European Jewry, and the obliteration of Vitebsk, his home town, where only 118 of a population of 240,000 survived the Second World War.” (Serena Davies, “Chagall: Love and Exile by Jack Wullscheger –review,” UK Daily Telegraph, 11 October 2008). Greetings thanks for great publish i used to be looking for this situation survive 2 times. I will look for subsequent precious posts. Have fun admin. I’ve been exploring for a little for any high quality articles or weblog posts in this sort of house . Exploring in Yahoo I eventually stumbled upon this website. Reading this information So i am happy to convey that I have an incredibly excellent uncanny feeling I came upon just what I needed. I such a lot certainly will make certain to do not put out of your mind this website and provides it a look on a constant basis. Hello my loved one! I want to say that this article is awesome, great written and include approximately all important infos. I’d like to peer more posts like this . Great post and interesting thread below, thank you! “Chagall never left childhood” you wrote. That even shows in the organisation of the space in his painting I think. I believe he builds his scenes like children do, with important characters bigger than less important objects. He also uses very bright colours, but there is nothing childish about where he places them (look how the colour links the synagogue of the shtetl to his fiancee (or wife) in “Spaziergang..” : he is sharing with us either a wish , either a happy souvenir). He depicts memories, and they all telescope as in our dreams…he must have had a very dominant right brain !!! He was an eternal child. And the brilliant colours are those a child would choose. He’s great. Merci de m’avoir écrit. C’est très gentil. Merci. Thank you for writing. That’s very kind of you. Micheline, my dear, thank you much for this article in which besides your travel in Germany and Paris together with your husband, mention biography of Marc Chagall. I did not know this artist and I’m glad that you do know. Beautiful. I’ve been meaning to ask you Micheline, whether it’s you who puts together these pieces. This one was particularly evocative, with Sondheim matching and adding a modern dimension to the images. Also, there’s a reference in Chagall’s birthday (O.C.) that, once clicked on, brings up a Not Found page. I think I know what you’re referring to, though, about his DOB. Thanks for this. He was born on July 7 according to the Gregorian Calendar but about twelve days earlier according to the Julian Calendar. The Russians (Eastern Church) celebrate Christmas on the day others call Epiphany. The difference is about twelve days, the twelve days of Christmas. I have written blogs on this subject. I will try to find them. So its old style, new style. That makes sense. Thanks Micheline. I’ve always loved the childlike, clear-eyed whimsical ‘optimism,’ that seem to transpire from his paintings, despite the gruesome experiences he went through. A true survivor, and in that, I wish people in Aurora would have a chance to experience his art as a healing tool too, for what they are going through right now. All the best. Chagall never left childhood. He went through the worst experiences, but his art was not darkened by these. Of course, the people in Aurora could you this.